Below are common attributes associated to Red Sprite Holly. Become a care taker for Red Sprite Holly! Below are member comments regarding how to plant Red Sprite Holly. No comments have been posted regarding how to plant Red Sprite Holly. Be the first! Do you know how to plant Red Sprite Holly? Below are member comments regarding how to prune Red Sprite Holly. No comments have been posted regarding how to prune Red Sprite Holly. Be the first! Do you know how to prune Red Sprite Holly? Below are member comments regarding how to fertilize Red Sprite Holly. No comments have been posted regarding how to fertilize Red Sprite Holly. Be the first! Do you know how to fertlize and water Red Sprite Holly? Below are member comments regarding how to deal with Red Sprite Holly's pests and problems. No comments have been posted regarding how to deal with Red Sprite Holly's pests and problems. Be the first! Do you know how to deal with pests and problems with Red Sprite Holly? Looking for Red Sprite Holly? 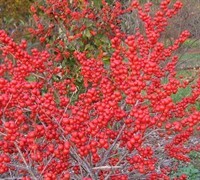 Fertilize with Holly-Tone or a general purpose fertilizer before new growth begins in spring. Prune in late winter or early spring before new growth appears. Remove any dead, damaged branches or unwanted sucker shoots from base of plant. When pruning to decrease size or to shape it is best to cut back to a bud, the direction of the bud determines the direction of the new growth.